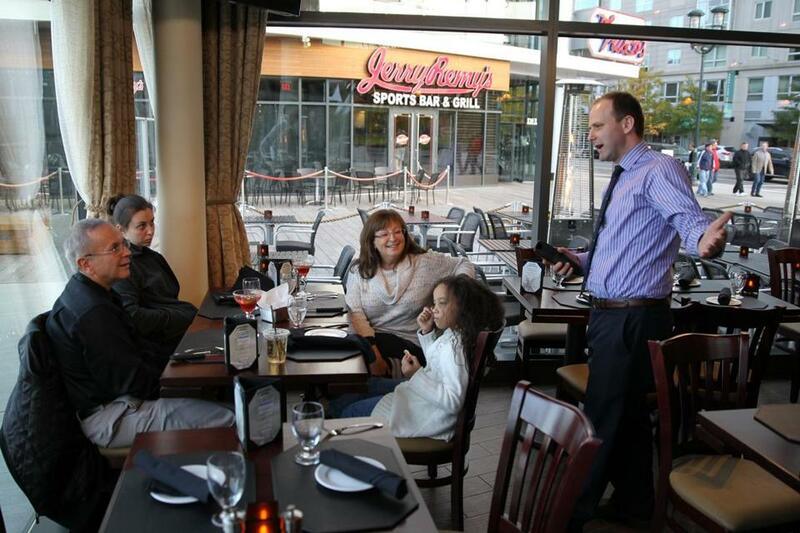 75 on Liberty Wharf held a family and friends evening before opening to the public. The restaurant is in a 1,500-square-foot glass kiosk on Boston Harbor. Barth Anderson was among an early wave of new food entrepreneurs in the Seaport District when he opened Barrington Coffee Roasting Company last year, gambling that as the economy slowly improved the nascent neighborhood would eventually turn into a full-blown community with an active social scene. But even he’s surprised at the speed with which the Seaport is filling in. In the next few months, another wave of restaurants and entertainment options is scheduled to open in the Seaport District, seemingly racing the developers who are rushing to fill in the area’s empty lots with office buildings and residential towers. The latest influx involves some of the biggest names in Boston’s food scene, from celebrity chef Ming Tsai to veteran restaurateurs Seth Greenberg and Tom Kershaw, with options that range from neighborhood tavern, to French bistro, to gourmet grocer. After several fitful starts, building activity in the Seaport District is taking off, with blocks of office towers and hundreds of residential units under construction, or soon to be. Many of the existing eateries in the neighborhood are among the most popular in the city, with Temazcal and the other restaurants at the new Liberty Wharf complex, in particular, regularly jammed. Next door, Kershaw, owner of Cheers, 75 Chestnut, and the Hampshire House, just opened 75 on Liberty Wharf in a 1,500-square-foot glass kiosk on Boston Harbor, where diners can sip cosmopolitans and feast on pumpkin ravioli as boats bob in the distance. Developer Young Park envisioned this kind of boom back in 2004, when his company, Berkeley Investments Inc., began buying up buildings in the Fort Point area. Among his first projects was a complex on Congress Street where he developed the FP3 condos. Park then convinced two Boston food celebrities, Barbara Lynch and Joanne Chang, to be among the first to venture new eateries in the burgeoning area. In 2008, Lynch opened Sportello and craft cocktail bar Drink at a time when Congress Street was a lonely strip at night. Two years later she followed with deluxe French restaurant Menton. Opening with pricey plates during a slow economy was “crazy, crazy, crazy,” she recalled. Having survived that time, Lynch said she is pleased to welcome high-wattage company to the neighborhood. “Bring it on. We need it,” said Lynch. Park, meanwhile, had held off leasing several of his other choice retail locations, turning down offers from national chains, until he found food entrepreneurs that he felt fit the tone of the emerging Seaport. In the storefront next to Chang’s Flour Bakery, Jason Owens, former co-owner of The Biltmore in Newton and Local 149 in Southie, will open a gourmet grocery next month. The Bee’s Knees Supply Company will have a fishmonger, butcher, and chocolate cafe. Park said the restaurant, set to open next fall, will be run by a celebrity chef whom he declined to identify. And around the corner at 343 Congress St., Park said, another chef is interested in a space being vacated by a lighting shop. “We had a vision for the street. The vision is being realized. It’s very satisfying,” said Park. A few blocks away from Park’s building, Tsai is planning to open Blue Dragon, an Asian gastro pub, this winter in a former deli on A Street. “I am so psyched to be coming to the neighborhood,” said Tsai, who made his mark with the celebrated Blue Ginger in Wellesley. Another addition to that area of the Seaport will be Tavern Road, a rustic-style restaurant where all the dishes will be made from scratch. Scheduled to open in the spot vacated by the Blue Wave on Congress Street, it is the first venture by Louis Dibiccari, a Boston-based chef who runs a popular “Iron Chef”-like event called Chef Louie Night. “I feel really excited to be part of something that’s new and not a stagnant neighborhood oversaturated with restaurants already,” said Dibiccari.